Daily diets vary considerably around the world. National Geographic therefore built an interactive visual to show the domestic utilisation for food consumption in each country or region from 1961 to 2011. Food groupings and units of measure vary slightly from those depicted on the FAOSTAT site. 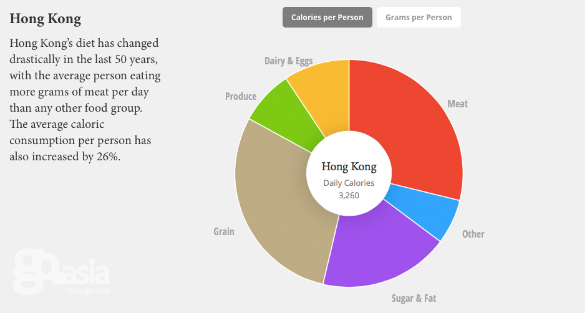 Hong Kong’s diet has changed drastically in the last 50 years, with the average person eating more grams of meat per day than any other food group. 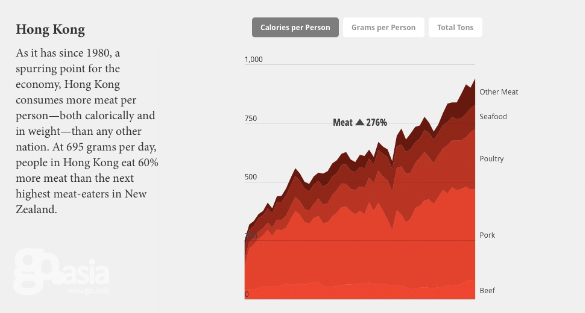 The average caloric consumption per person has also increased by 26%. Since 1980, a spurring point for the economy, Hong Kong consumes more meat per person-both calorically and in weight-than any other nation. 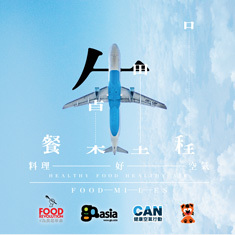 At 695 grams per day, people in Hong Kong eat 60% more meat than the next highest meat-eaters in New Zealand.